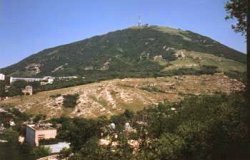 Mt Mashuk is the most interesting one in the Caucasian Mineral Waters region and is the best viewpoint in the vicinity of Pyatigorsk. The legend about Mt Mashuk has been preserved through the ancient times till our days. Many centuries ago the Great Khan of the Golden Horde Kaplan-Girey with his great army invaded Kabarda region (the ancient name of the region). The inhabitants were humiliated and desecrated by invaders in different ways. There was only one man among the locals who revenged the invaders for his bride's death. His name was Mashuk. The invaders surrounded Mashuk and his friends on the slopes of one of the mountains. There was a cruel battle in which all of his friends had been killed. Very tired and wounded Mashuk didn't want to be captivated and jumped down the rock. The news about his death filled the people's hearts with anger. And they have rioted against the invaders. The region was liberated from the invaders. In memory of the brave hero people named the mountain with its cold and warm sources where he fought and died by his name. A cable car will take you from the upper part of Pyatigorsk to the top of Mt Mashuk for fresh breezes and a great panorama. It takes you 3-4 hours to come up and down the mountain. On your way youll be able to visit the Lermontovs Grotto, a small cave which the writer used to visit, the Academic Gallery built in 1851 by an English architect Upton to house one of Pyatigorsks best known springs, and the Proval, a cave open to the sky where 19th century couples would dance on a bridge over the pond of light blue sulphurous water.